If you are a certified public accountant or are a part of an accounting firm, consider the .accountant domain for your website. First delegating in 2015, the .accountain domain extension was designed to provide accounting professionals with a safe and secure digital space for networking. It’s a recognizable extension that can help potential clients connect with you in confidence. While it is predominantly used by those in the accounting sector, the domain is a generic top-level domain. This means that it comes with no major use restrictions or complex application processes. The .accountant domain extension offers a number of benefits to owners. First and foremost, it highlights your industry and shows web users what kinds of services you have to offer. The extension creates a sense of professionalism that visitors can connect with instantly. 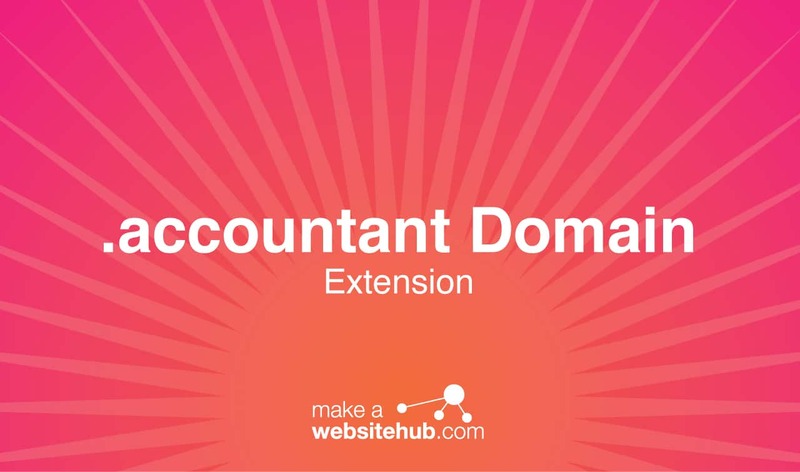 In a market filled with traditional .com websites, the .accountant domain extension can prove to be a useful marketing tool all on its own. It’s an extension that has become synonymous with financial service, so why not use this fact to your advantage? When people are looking for reliable accounting services, they will be more inclined to click on a link that exudes professionalism and know-how. The .accountant domain does just that. The .accountant domain extension can also be used in your company’s advertisements or branding. You can easily incorporate the domain onto fliers, billboards, website art, and physical products. It’s memorable and distinct, making it easier for potential clients to get information about you and your company. The extension can also do wonders for your website’s search engine optimization. The extension alone contains a vital keyword for your industry. Anyone searching for accounting services in your area will be able to find your website easily, helping to produce increased website traffic and business. The .accountant domain can serve many different organizations, business entities, and individuals within the accounting industry. In just a few short years, the domain has become a very popular option for certified public accountants and bookkeepers. Creating a memorable web address in these cases is as simple as using your name. For example, an address like YourName.accountant makes your website look professional while creating a sense of trust and credibility among web users. Businesses can also utilize the domain to attract attention. Something like LocalCertified.accountant or FirmName.accountant is a great example. It’s easy, to the point, and very memorable. Alternatively, you can use domain hacking techniques to come up with a creative website name. This a popular choice for finance-focused bloggers, accounting forums, and networking websites. Examples of domain hacking with this domain include FindAn.accountant or YourLocal.accountant. Where Can You Buy a .accountant Domain Extension? Purchasing a .accountant domain couldn’t be easier. It’s offered by most domain name registrars. Like other generic top-level domains, you can register a .accountant domain for periods as long as 10 years. Here are some registrars you should take a look at.